Beijing wasted no time in striking back at Washington’s latest round of tariffs on Chinese imports by announcing a new list of US products that would be subject to punitive action, as the world’s two largest economies edge ever closer towards an all-out trade war. China’s State Council said on Wednesday it planned to impose additional tariffs of 25% on 106 US products imported into the country, including soybeans, airplanes, cars, and chemicals, CCTV reported. The Ministry of Commerce said the import value of the goods on the list in 2017 was $50 billion. The effective date will depend on when the U.S. action takes effect. Beijing’s retaliation came just hours after the United States Trade Representative Office released details of hundreds of Chinese imports worth about $50 billion that it planned to hit with 25% tariffs, with the emphasis on industrial and hi-tech goods. "China’s response was tougher than what the market was expecting - investors didn’t foresee the country levying additional tariffs on sensitive and important products such as soybeans and airplanes," said Gao Qi, Singapore-based strategist at Scotiabank. "Investors believe a trade war will hurt both countries and their economies eventually." As reported last night, the US list covers 1,300 items, including high-definition colour video monitors, electromagnets used in MRI machines, aerospace products, and machinery used to make processed textiles, printed products and food. Beijing responded immediately to the US announcement saying it would “take corresponding measures of equal scale and strength against US products in accordance with Chinese law”. USTR developed the tariff targets using a computer algorithm designed to choose products that would inflict maximum pain on Chinese exporters, but limit the damage to U.S. consumers. A USTR official said the list got an initial scrub by removing products identified as likely to cause disruptions to the U.S. economy and those that needed to be excluded for legal reasons. USTR did include some key consumer products from China, including flat-panel television sets and motor vehicles, both electric and gasoline-powered with engines of 3 liters or less. A Reuters analysis that compared listed products with 2017 Census Bureau import data showed $3.9 billion in flat-panel television imports, and $1.4 billion in vehicle imports from China. As Reuters notes, unlike Washington’s list, which was filled with many obscure industrial items and "in process" goods - from light-emitting diodes to chemicals and machine parts - China’s list strikes at signature U.S. exports. China's foreign ministry spokesman Geng Shuang said China had shown sincerity in wanting to resolve the trade dispute through negotiations. “We regret that soybeans are on the list. We have done everything to prevent this from happening, but we are still calling for a resolution,” said Zhang Xiaoping, China director of the U.S. Soybean Export Council told Reuters. 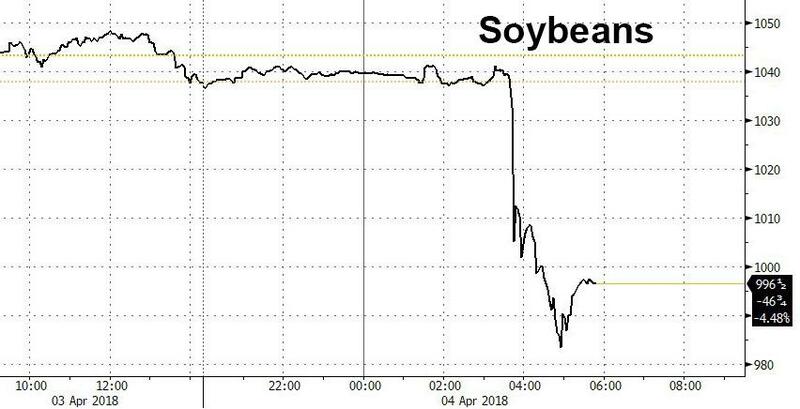 To be sure, the unexpected inclusion of soybeans on the list of Chinese tariffs - a sign that Beijing has no intention at diplomatically ratcheting up the heat - sent the price of soybeans tumbling as much as 5.3%, the biggest drop since July 2016. Wheat, corn, cotton were also down. 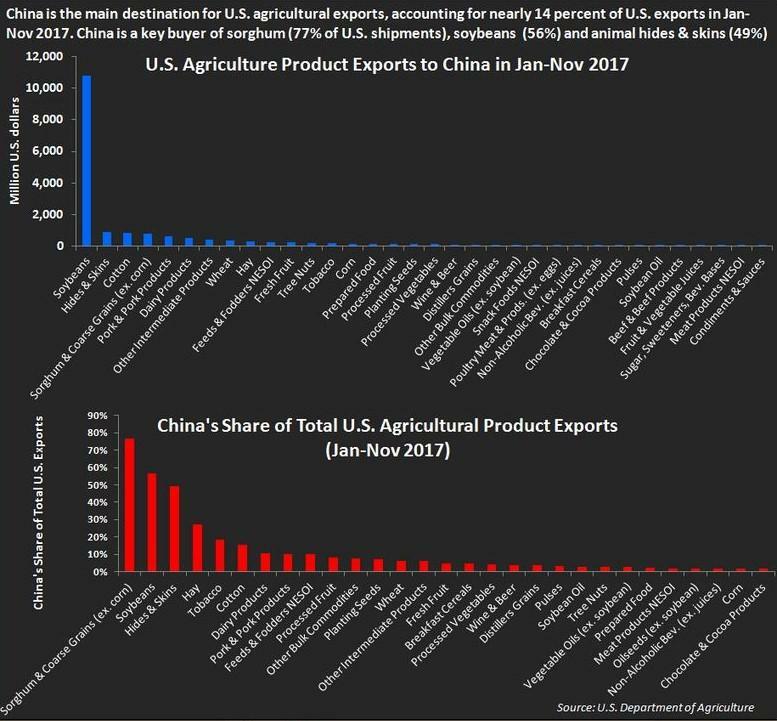 The reason for the plunge in soy prices is that China buys about a third of the entire U.S. crop, using it largely to feed 400 million or so pigs. 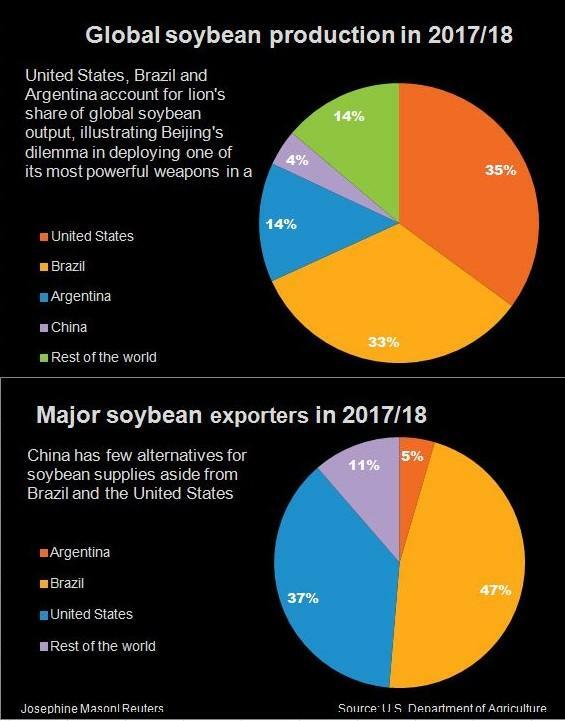 Argentina and Brazil are the other suppliers, but analysts warn that's not enough to meet the entire Chinese demand. Paradoxically, by limiting soybean imports, China risks unleashing food inflation and roiling social stability on the mainland, by far the single most important variable for any Chinese administration. There was some good news: many consumer electronics products such as cellphones made by Apple and laptops made by Dell were excluded, as were footwear and clothing, drawing a sigh of relief from retailers who had feared higher costs for American consumers. A U.S. industry source said the list was somewhat unexpected in that it largely exempts major consumer grade technology products, one of China’s major export categories to the United States. “The tech industry will feel like overall it dodged a bullet,” the source said, but added that traditional industrial goods manufacturers, along with pharmaceuticals and medical device firms could suffer. In any case, the speed with which the trade war between Washington and Beijing is escalating up – the Chinese government took less than 11 hours to respond with its own measures – led to a furious selloff in global stock markets and commodities: U.S. stock futures plunged over 1.5%, the Dow tumbled over 450 points and the dollar briefly extending early losses. China’s yuan skidded in offshore trade. Boeing was among the biggest losers, tumbling 6% premarket, after China's announcement, as the Dow-heavy aerospace giant had been mentioned as one of the biggest casualties from an all out trade war.